When something acute happens, like a traumatic car accident or terminal illness diagnosis, the natural reaction is to jump into action making plans. On the other hand, age-related cognitive decline such as Alzheimer’s disease and dementia don’t always cause such immediate impact. Rather, signs and symptoms unfold over a period of time, making it difficult to know when memory care is truly needed. There are also the psychological and emotional impacts of dementia-related conditions on a person’s spouse, loved ones and family. 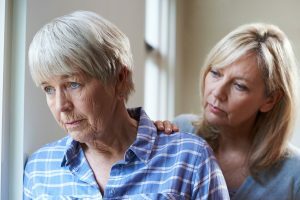 Denial, emotionally driven conversations and the thought that caregiving can’t be that difficult, all add to the challenge of making mindful, long-term care plans. Multiple studies show moving those with Alzheimer’s or dementia into memory care communities sooner, rather than later, results in better outcomes for patients–mentally, physically and emotionally. The following are five clear signs it’s the right time for memory care. Everyone is forgetful at times, and this forgetfulness increases with age. However, routine forgetting of important dates, names, how to get to familiar places, to pay bills, etc. is not normal. These are often the first signs of dementia and should trigger an appointment with your physician. Once a diagnosis is given, it’s time to begin having conversations about memory care. The desire to live at home for as long as possible is understandable and encouraged in the beginning stages so long as there are no serious safety issues at risk. At the same time, this is your best opportunity to begin visiting, touring and exploring reputable, licensed memory care facilities in your area. This process results in a wealth of information and resources. As mentioned above, studies show that it’s better to transition individuals from home into memory care before more dangerous signs and symptoms of dementia or Alzheimer’s surface. Transitioning earlier allows your loved one to have a say in his/her future which is extremely important. It also enables necessary adjustment time, so they’re in familiar surroundings, forming relationships and connections with staff, employees and other residents when they progress to later stages of dementia. Caregiving for a loved one with memory care is a 24/7 occupation. Without engaging in regular respite care, it becomes impossible to sustain the situation. Even with qualified, in-home care providers, those with mid to later stages of memory loss require increasing levels of medical assistance, and the enormity of unceasing tasks is more than almost any household can accommodate. If you’re approaching, or have already reached, a point where caregiving is all-consuming, it’s time to consider memory care. Similarly, if you find yourself a member of the “Sandwich Generation”, stuck between an aging parent requiring care, a job and the needs of your own family, memory care is a must or else you’ll quickly go from being a caregiver to needing a caregiver of your own. As memory loss sets in, so do the abilities to drive a car, make grocery lists, prepare food, remember daily medications, or even remember to eat. Losing track of days and times has a disastrous effect on the circadian rhythm, contributing to Sundowner’s syndrome, insomnia and other sleep disorders that take on toll on one’s health and well-being. The inability to remember how to get home or where one is going puts patients at risk for injury, getting lost or becoming victims of scams and potentially violent crimes. Similarly, those with dementia are more prone to being injured at home and are less able to remember how to seek help, forgetting to press a “life alert’ button or how to use the phone to call 911. If you find yourself worrying about a loved ones’ well-being on a regular basis, the transition to memory care brings peace of mind while simultaneously ensuring s/he is supported, attended to and cared for day-in and day-out. The social life of someone with dementia shrinks considerably, exacerbating and even accelerating the condition. In addition to on-site medical care and low caregiver-to-resident ratios, memory care facility residents have rich and vibrant social lives. Daily activities, supervised excursions, and creative outlets are a foundation upon which these center were developed, and the positive benefits of those outlets are evidenced. Read about our Philosophy to learn more about the research and wisdom behind memory care centers, and to learn about our own Town Center design, which helps residents feel connected to neighborhood-based lifestyles. Inevitably, your gut instincts never lie. If you deeply suspect it’s time to move a loved one into memory care, it’s undoubtedly true. Honor that feeling with a consultation at memory care centers near you, and your wise intuition will lead you to the best path forward. Spouses and family members often find themselves at a loss once a tipping point is reached when, quite often, accidental injuries, malnutrition and diminished quality of life force everyone’s hand. Don’t wait until your loved one is getting worse, or you and your family members are mentally and physically exhausted. Understand the signs and symptoms of cognitive decline. Be aware of your loved one’s health and well-being. Start your research on memory care now, before they need it.